So far, so good, this winter. 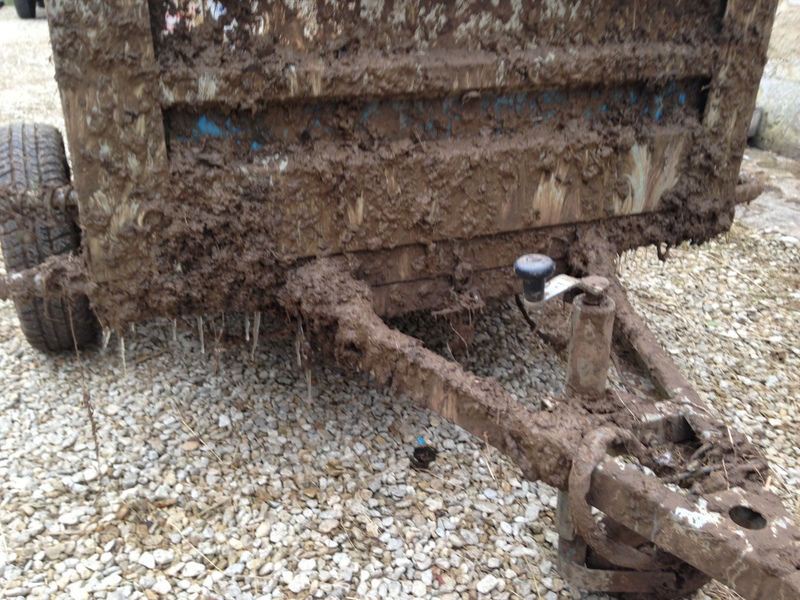 This was our trailer, which got a tad muddy bringing hay out to the horses in the field… Getting this through a muddy gateway with about 16 peckish horses meant there was no need for coffee in the morning: the adrenaline rush and the thought of getting stuck were enough to keep the heart beating fast…. 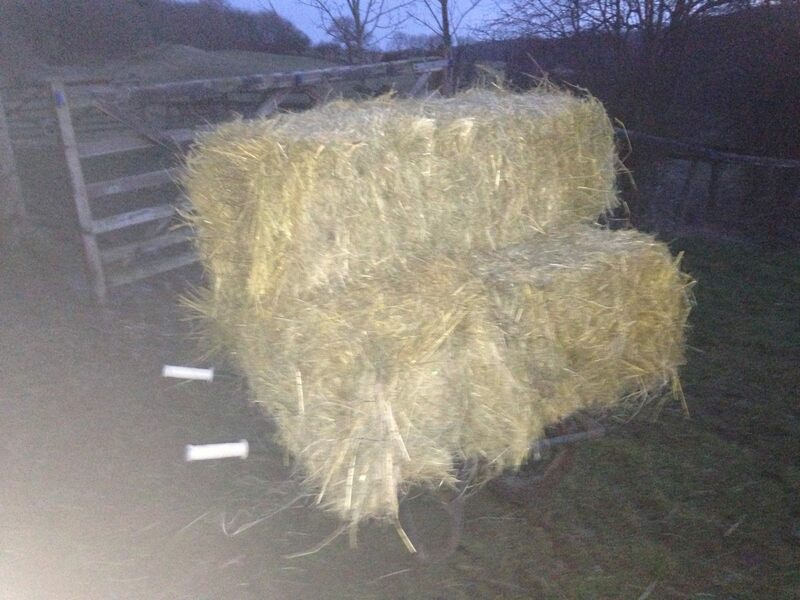 Of course, when the quad bike broke and we were doing it by hand with a wheelbarrow, all the more fun! Someone said this constitutes wheelbarrow abuse! Can’t think why my arms ached at the end of that winter…. I don’t mind admitting that winter 2013/2014 was challenging. Not cold, but very wet, and we had 4 horses in off the field for a variety of reasons, and no real help (we have learnt from experience that it is a bad time to recruit anyone!). 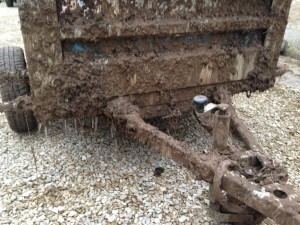 It was a long slog, it was very muddy, and finances were….. worrying. We had definitely joined the “we’re working too bloomin’ hard to be this bloomin’ poor club”, but we couldn’t remember ever having asked to join. We are thinkers, and we do believe in taking action rather than complaining, but it can be hard to see your way out of a situation when you are deeply embroiled in it, especially when that situation keeps you so busy. I guess home-educating two young children also is a factor…. Now, it just so happens that one of our livery clients, Gill Smith, is an excellent business coach, with her own consultancy (Avro Consultancy Ltd), and is co-founder of a marvellous organisation called The Business Kitchen, so when she offered us a session we of course jumped at the chance. If you’re anything like me, though, there is a part of you that says “but I know what I need to do, I just need to get on and do it, and taking time out of my busy schedule to talk about all the things I need to do isn’t very helpful.” Perhaps there’s even a sense that you shouldn’t need help or advice and that it’s in some way cheating to even think of it. And it is true, I think, for a lot of people that you’re unlikely to discover The Secret of business success that turns out to be something you had never heard of: “Oh, I need money you say? What is this strange stuff of which you speak?”. Nevertheless, a key factor in all growth and development, personal or business, is having the opportunity to sit back and evaluate your circumstances, examine some of your assumptions, identify any blocks or self-sabotaging behaviour, and gain a level of clarity that is unlikely to just materialise otherwise. Having a skilled facilitator can really help you break through to where you need and want to be. In a partnership like ours, as well, it is particularly helpful to have a third party involved to evaluate our ideas from a neutral point of view, and if there are differences of opinion it is so much less likely that it will turn into an argument! It also really helps to have the clarity that comes from agreed action plans, and having a clear set of priorities that we are both working on frees us up to get on with generating the business income. We had decided, even prior to the meeting with Gill, that what we wanted was more liveries. Strangely enough, less than a year later, we find ourselves in precisely the position we wanted to be in. We knew it was likely that we would get more enquiries in the late autumn/winter, because that’s when most people discover what their yard manager meant by “year-round turnout”. And several clients came to us for that very reason – either they weren’t allowed to turn their horses out, or if they did, it was into hock-deep mud that the horses didn’t want to be in. Our fields this year are holding up well, in spite of us having more horses than ever. There is mud, of course, and it is cold and damp (it is England after all), and we do have a horse posing us major management challenges (just to keep us on our toes, I suppose, and to make sure we don’t have it too cushy), but we are very happy with where we are. Workshops are being booked in for 2015, and there are other exciting ventures afoot. We did our initial couple of coaching sessions privately, but we then joined The Business Kitchen, and that has it’s own different dynamic, with the other participants adding immense value too. Really, unless you are making too much money, working too few hours, and finding life kicking along too smoothly, I would recommend it to any small business owner. I didn’t intend for this post to go quite this way! I was just going to talk about how nice it is that it isn’t very muddy and that we have a lot of lovely liveries, but when I think about the contrast between winter 2013/2014 and winter 2014/2015 (so far) I can’t write about it without mentioning the huge boost Gill and the Business Kitchen have given us.